The adult book discussion group will meet on April 24th at 3:00pm. 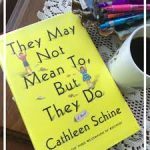 The group will discuss, They May Not Mean To, But they Do by, Cathleen Schine. Books are available at the circulation desk for loan. New members are encouraged and welcome to attend.